Hosted by presenter Phil Spencer for the 15th year running, the ESTAS is an independent national award scheme dedicated to recognising exceptional estate and letting agents across the country. What makes these awards so important is that the winners are decided purely on the basis of customer feedback. Countrywide is honored to have been awarded the 47 awards at leading ESTAS awards ceremony, held on Friday 19 April. Nominated for a record 110 ESTAS awards this year, Countrywide was awarded the top accolade of Best Large Estate Agency Group reflecting their position as the biggest residential estate agency and lettings network in the country. This year over 36,000 customers contributed to customer services ratings – a measure of just how personal and important buying, selling and letting a home is for people; and how important estate and letting agents are to helping customers achieve their goals. Commenting on the success at this year’s ESTAS, Paul Creffield, Group Operations Director at Countrywide, said: “I am delighted at Countrywide’s triumph at this year’s ESTAS and could not be happier for the team, the awards are a fantastic reflection of the effort and hard work on behalf of our customers. 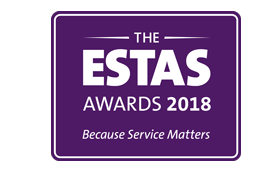 This award is particularly special because the ESTAS are a result of thousands of votes cast by the customers themselves around the UK – and this award confirms that our colleagues live up to our exceptionally high standards of customer service.